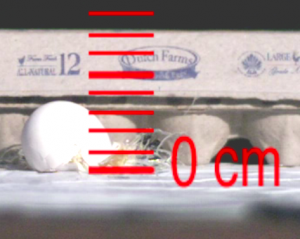 In this video series, a 0.052 kg egg is dropped or thrown down onto a concrete patio. Both videos were shot at 2000 fps. When doing calculations, please note that the collisions were not perfectly inelastic. In both trials there was significant liquid splatter in all directions. The apps for these videos have a simplified interface without automated plotting or graphical analysis tools. What is the initial momentum of the egg before impact? What is the final momentum of the egg after impact? How much time did it take for the egg to slow down? Using the relationship between impulse and momentum, what was the average net force on the egg during the impact? EXPERIMENT: How much weight does it take to crush an egg? How does this weight compare to the force you calculated in the video?